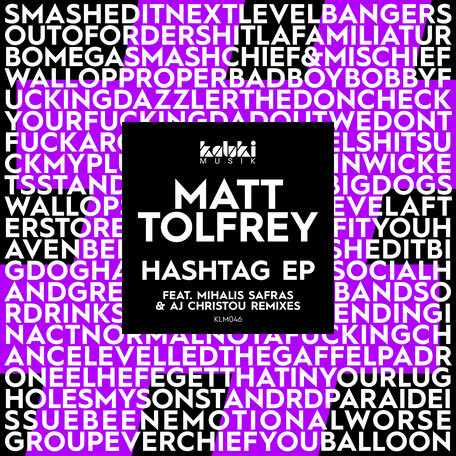 DJ/producer Matt Tolfrey is set to release a four track EP on Friday via Kaluki Muzik, featuring two original productions and remixes from Mihalis Safras and AJ Christou. With a back catalogue featuring releases on Elrow, Material, No.19 Music and his own Leftroom, Matt has apparently garnered a reputation as an open-minded artist with the ability to both read and lead a crowd. After his first remix as a solo act appearing on KLM001 and more recently contributing a remix to Francisco Allendes’ ‘Tirana EP’, Tolfrey returns to Manchester’s Kaluki Musik with his own ‘Hashtag EP’. Remixes come from two label owners, Greece’s Mihalis Safras, known for his work on Material, and AJ Christou, known for imprint Celesta Recordings. ‘Hashtag’ hits hard with a powerful kick and a grooving low-end underpinning hooky vocal cuts, rave influenced melodies then provide variation to make the track a robust dance floor cut. AJ Christou’s take follows, retaining the high-energy focus with cymbal work, clean bass hits and airy atmospheres while also adding his own transitional flare to create build ups and breakdowns. An elastic bass hook, crisp percussion and chopped vocal samples drive underneath enticing mid-range motifs and rolling claps to create rhythms in ‘Big Things feat. Kaz’ next, before Mihalis Safras’ take on the track provides impactful low-end, sharp percussion and reverberating vocal licks to close the release.